CHIANG RAI: The threat of rainfall is forcing rescue teams to revise an exit plan for the 12 young footballers and their coach who may have to be brought out of the partially flooded Tham Luang cave before their physical condition is fully restored. 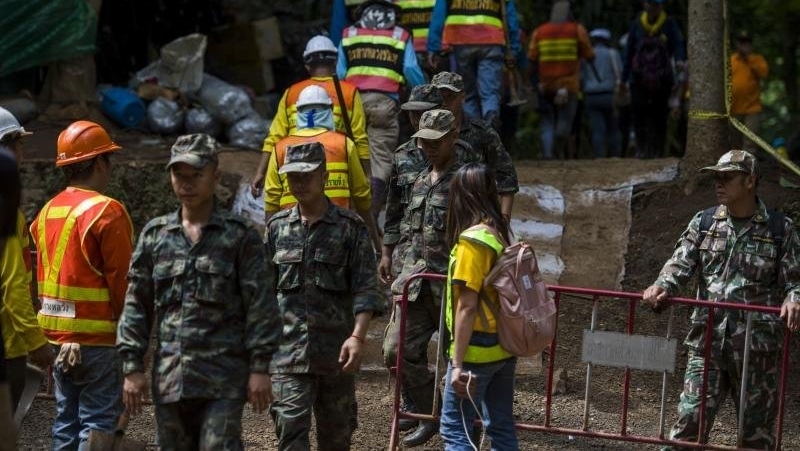 At this stage how and when the trapped “Moo Pa” (Wild Boar) team, as it is known, will be extracted from the cave complex in Chiang Rai’s Mae Sai district remains a challenge. One possibility is to keep the water level in the cave low by pumping the water out so the 13 people who are nursing themselves back to health can dive out safely when they are ready. However, rescue operations commander Narongsak Osotthanakorn admitted yesterday (July 5) that the rescue teams do not have time on their side and they are concerned about weather conditions. More rain is forecast next week which can complicate the extraction. He said the rescue teams are worried about the water level in the cave and make calculations to determine the risk if more rain comes down and raises it further. The tricky point in the cave is a narrow passage called Sam Yak. According to Mr Narongsak, rescue teams are assessing how many days they have to pump the water out until the water level at Sam Yak falls to a manageable level and how many hours they will have if they cannot maintain the water level. “We can’t risk the cave being flooded,” Mr Narongsak said. “We need to have a plan if we want to bring them out before their physical health is back 100%. We do have a plan and if it all fits, we will proceed. The medical teams and the diver teams will determine things,” he said. The group is being looked after by the medical teams and the navy divers who are teaching them how to use diving gear. Earlier, Mr Narongsak said the group would be extracted when they were 100% physically fit. He said draining water outside the cave remains the core mission and the boys and their coach are in good spirits. He said it would take time before the boys can talk to their waiting families while telephone lines are being fed into the cave, noting that it takes about 11 hours to get in and out of Nern Nom Sao, the spot where they are taking shelter. While the 13 people will be taught how to dive, other rescue teams are searching for openings from the cave ceiling that can be used to extract the group. According to AFP, rescuers who reached the group of children trapped in the cave say finding them was the easy part; getting the youngsters out safely will be the real challenge. The path back to the entrance is long, cramped and at least partially submerged. It is possible some of the boys cannot swim, and all have been weakened by 12 nights underground. Japanese engineers have helped rig up a pumping system that is reducing water levels by one centimetre every hour.